The east London branch of this mini Indian empire has easily some of the best food in town, regardless of cuisine category. There’s not a bad dish on the menu, and the drinks stack up, as well -- this is the kind of place where you purposely over-order (as in, leftovers). With high ceilings upstairs and intoxicating smells of the semi-open kitchen downstairs, there’s always a buzz here; put your name on the list, head to the bar, and embrace the food coma that's headed your way. You’ve probably realized that Peruvian food is the new hotness by now, so do yourself a favor and roll through Martin Morales’ bright space on the corner of Redchurch and Shoreditch High St. The food itself is light enough to be borderline healthy, whether you go for street food (the chicharrón sandwich) or opt for the classics (line-caught tuna tartare), the flavors will be very real indeed. If you'd rather go big, there's always the whole suckling roast piglet: it's fit for 10 people, and must be ordered five days in advance. Plus, between the front room, chef's counter, downstairs dining space, and the hidden room in the back (hello skylight! ), the staff can usually find somewhere to squirrel you away. 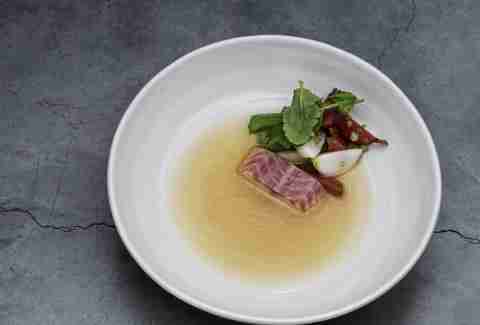 While Shoreditch has long been a hotspot for Korean chow, On the Bab introduced the concept of Anju -- quite literally, "food for drinking." This tiny eatery is always packed to the brim, but seating moves quickly, so you’ll be gorging yourself on kimchee pancakes in no time. On the Bab also does great take-away service, for when you want bulgogi beef without having to deal with the outside world. 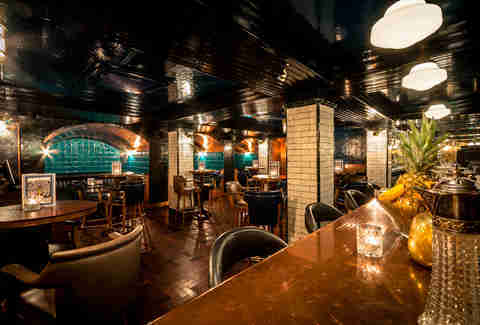 The original Hawksmoor location has been slinging ridiculously great meat for a decade, and has yet to slow down: British beef, award-winning cocktails, and service that makes the experience so effortless. Birthday? Meat. Promotion? More meat. It’s a Saturday? Obviously, you’re going to stuff your face with meat. Pro tip: the basement bar is worth a trip in its own right, with burgers and booze that will knock your socks off. 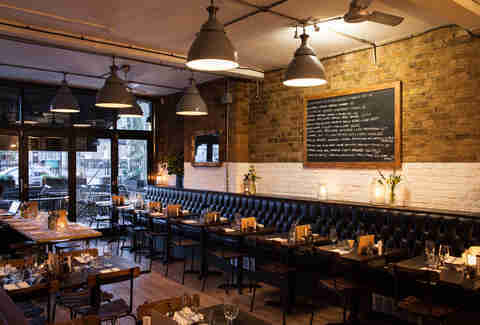 This offshoot of the Michelin-Starred powerhouse over in Farringdon is rather understated, and in keeping with the nose-to-tail ethos of life, the menu might push a few too many boundaries for the conservative eater. However, if the sound of ox hearts, bone marrow, and blood cake with a fried egg makes you weak at the knees, you'll be in heaven. 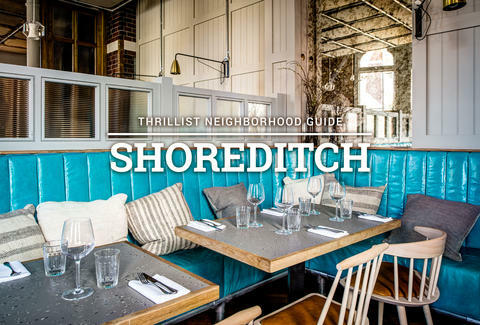 This multistory playhouse ticks all the boxes: stylish pub vibes on the ground floor, dining room with next-level fare on the first, and a seasonal roof terrace up top for catching those temperamental rays. Word on the street is there's even a micro hotel opening on the second floor, as well, so if you find yourself really settled in, you can always just stay the night. There’s always a good selection of beer around, the food is delicious and always changing, and the cocktail game here is better then some actual “cocktail” bars. This high-ceilinged warehouse in the base of the Tea Building appears pared back and simple, and on one hand, it is. But after seven courses of Michelin-Starred food, you’ll find yourself wondering what crazy witchcraft they’re using to make it all taste so damn good. Sticking to an easy tasting menu format (which changes daily), Lyle's requires blissfully little brain power, so all you have to do is sit back and let the attentive staff take care of all the details. Sometimes you just really want good food. 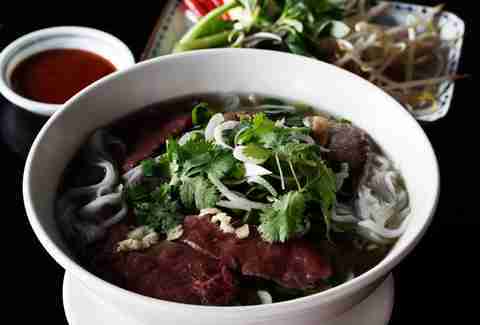 Nothing trendy, no airs or graces, just well-priced and delicious Vietnamese food. The lunch deal here means you can get a starter and a main for around a tenner, and you'll almost always get a table if you don't mind waiting a couple minutes. Don't sleep on the Piggy Grilled Aubergine (it’s exactly what it sounds like), or the summer rolls, for that matter. 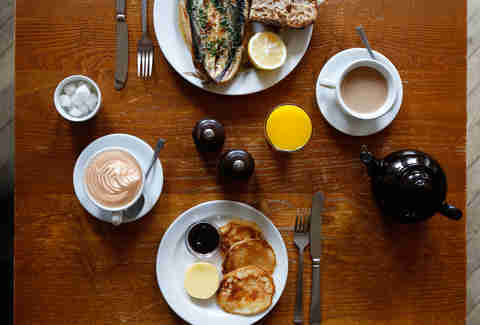 London has plenty of amazing coffee, but Ozone takes things to another level by dishing out exceptional food as well. Serving brunch till 4pm, and an all-day menu from 11:45am - 8pm, Ozone provides a bunch of options to keep the coffee shakes at bay. And we’re not just talking sandwiches and muffins: you'll also find bigger plates, like braised beef short rib with sweetcorn polenta, wild mushrooms & kale, or citrus mackerel with apple, gem lettuce, and dill buttermilk dressing. This place is made of a great mix of ingredients: comfortable tables, reservations, reasonable pricing, and -- above all -- delicious food. With laid-back service and a regularly changing menu, it’s the kind of spot you can visit repeatedly without getting bored. Seriously, do roast Tamworth pork and buttermilk fried cod cheeks sound boring? 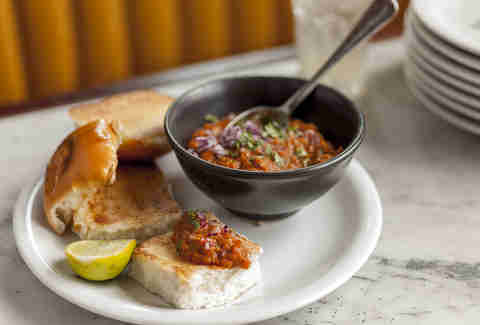 Plus, the all-day nibbles served between lunch and dinner are outstanding. Do yourself a favor and get the gorgonzola custard. It’ll change your life. Hidden just off Hoxton Square, this cult-inducing church of meat is the kind of place where no one will judge you for scarfing down your food. While the burger's always a winner, it's the chili cheese fries and monkey fingers (like buffalo wings, but with no bones to get in the way) that cause tables to fall into communal meditative silence. Feeling competitive? Ask about the Triple Chili Challenge -- it’s not for the faint of heart. This place manages to walk the line between elegant and rustic, and while the reservation system take a bit of getting used to -- you buy tickets like you would for a show -- the food's fantastic enough that you won't care. Since it’s all about the tasting menu here, you'll want to block off a good chunk of time to get acquainted with everything from Cornish mackerel to Yorkshire suckling pig. Of course, if you're not feeling up to the whole shebang, the bar menu features plenty of fantastic drinks and snacks you’ll wish you could order by the bucketful. Yes, fried chicken, we're looking at you. Haley Forest is a writer who lived for many years in Shoreditch and had the wonderful problem of choosing where to eat all the time. It was hard, but she got through it. Follow her at @HCForest.